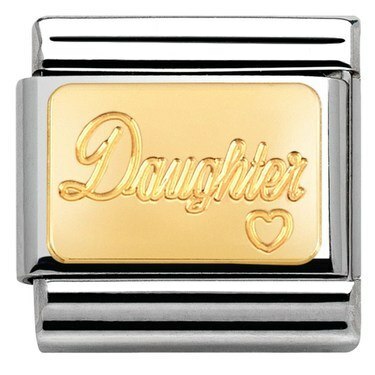 This beautiful charm has been lovingly engraved with the word "Daughter". This Nomination charm is the perfect sentimental gift your daughter can cherish on her Nomination bracelet forever. The item was received in excellent condition and was exactly what was ordered. The delivery time was unbelievably short and the packing was excellent a really professional job. In my opinion this company means business. Purchased this as a gift for my Daughter , she was delighted with it and as always excellent service from Argento . Purchase all my nomination charms from Argento and would highly recommend . This charm is jut beautiful. I bought is as a present for my daughter and she loved it. Thank you. So very quick delivery and beautifully presented. Bought as a Christmas present but sure my daughter will be delighted. Usual good,speedy service from Argento. As always, first class service. Beautiful charm and well packaged and arrived very promptly. Fast delivery and very well packed. It’s beautiful and I can’t wait to give her it. Bought as part of daughters Christmas present which she loved. does this charm fit all nomination bracelets.My daughters is a plain band with a little thin block on it.